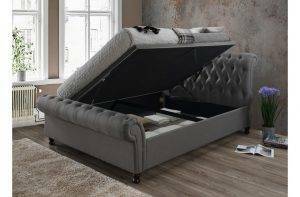 The perfect storage solution for any home, the ottoman bed is practical, whilst retaining style in your bedroom. We have a great range of beds with lift up bases to maximise your storage with ease. Choose from end opening, side opening or half opening with drawers. 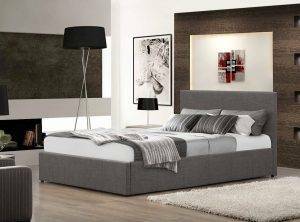 The Wesley in steel fabric looks not only attractive suiting any style bedroom, but provides an excellent storage solution. 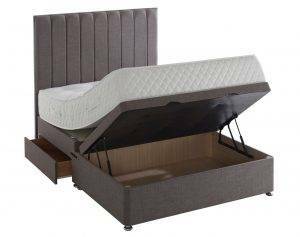 The Wesley features a platform base, and gas lifting arms, making the bed easier to lift up to reveal the storage underneath, with a floating floor keeping your items off the ground. Also available in mink. A classic design, the Berlin fabric ottoman adds both style and versatility to any space. With strong gas-lifts to access the storage space, this frame is upholstered in a choice of fabric options. A sprung slatted base for natural bounce, the frame adjusts to where pressure is exerted most, providing greater comfort. Available in a choice of brown PU leather or grey upholstered fabric. 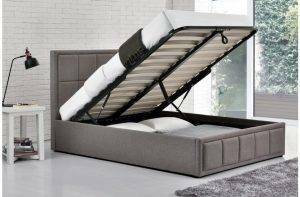 The storage base can be fitted to open on either the left or right-hand side of the bedstead giving you that extra flexibility. The Castello side ottoman is available upholstered in a steel velour, charcoal or grey fabric. 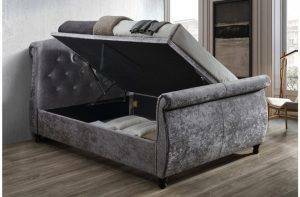 This contemporary sleigh bed features a side opening ottoman which can be fitted to open on either the left or right-hand side of the bedstead giving you extra flexibility. Upholstered in either steel or black textured fabric, with complementary dark rubberwood feet. Side opening ottoman base, available in all sizes, and with a choice of 20 colours to match in with your bedroom colour scheme. Matching headboard’s also available. Convenient, space saving, storage maximising bases, available in all sizes, and with a vast range of colour options. 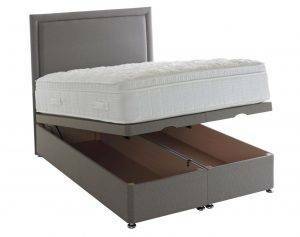 The Half Ottoman 2 drawer base offers twice the storage space, yet takes up the exact same amount of space as a regular divan bed. 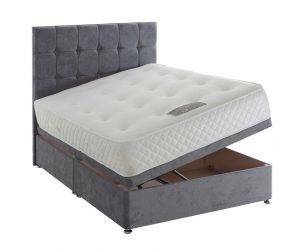 Innovatively designed so that you can lift half the mattress base exposing a large cavity underneath the mattress along with a traditional drawer setup. It reduces the stress and strains of lifting an entire mattress. A superb quality product that uses a side lift hydraulic lift mechanism which takes the manual effort of raising the base. Available in all sizes, and colour options a plenty.